Women have long been a rarity in construction, with little thought given to why. Obstacles like improper safety equipment, maternity leave, and workplace harassment often still stand in the way of women aiming for construction careers. By remaining a man’s world, the industry has neglected 51% of the workforce  and now faces a substantial labor shortage . Now, the industry is trying to rectify its mistake by actively recruiting women. These efforts include increasing visibility at recruiting events, creating proper fitting safety equipment for women, promoting participation in networking groups, increasing school programs for construction trades, and having more women in management positions. It’s working. More women are forging construction careers: 939,000 of them to be precise . Currently this accounts for 9.1% of the construction industry, by 2020 that number is expected to rise to 25%. This article provides a roadmap to the construction industry, how to get a job, what to expect once you’re there and how to advance in your career. The construction industry needs more women, and the statistics reflect that. Women will help solve the labor shortage problem, increase diversity, and enhance the workforce . Having more female employees leads to more job satisfaction, organizational dedication, more meaningful work and decreased burnout . A recent World Economic Forum study  found that women work 10% harder than men in today’s offices. This speaks volumes about the value of having women in the industry. Though women have made some big inroads in construction offices, with almost 76% of female construction professionals working on the office side, there is still a lot of ground to be gained in the field. While women haven't been traditionally considered for fieldwork, both construction firms and females stand to benefit by changing this status quo. Bringing in more female labor would easily offset the labor shortage, while the combination of high-paying skilled labor positions with a low wage gap offers a lucrative opportunity for unemployed or underemployed women. Construction managers oversee the successful execution of construction projects including budgeting, timing, and quality. They work closely with every member of the team to ensure success. The BLS predicts 17,800 new construction manager jobs by 2024, a growth rate of 5%. The three categories of carpenters are Residential, Commerical, and Industrial. Their overall responsibility is to build a structure's framework according to the specifications of the architect. The BLS predicts 60,400 new carpentry jobs by 2024, a growth rate of 6%. Inspectors ensure that structures are safe according to local codes, regulations, zoning, and ordinances. Specialities include Building, Electrical, Mechanical, and Public Works. The BLS predicts 8,100 new building inspector jobs by 2024, a growth rate of 8%. These operators are responsible for maneuvering and using their equipment safely, as well as understanding how to recognize problems and perform basic maintenance. The BLS predicts 43,200 new equipment operator jobs by 2024, a growth rate of 10%. Masons assemble structures such as walls and walkways ranging from brick, stone, and concrete. They use plans from the architect to calculate, prepare, and assemble materials to the specifications. The BLS predicts 37,300 new masonry jobs by 2024, a growth rate of 15%. The installation, repair, and inspection of pipes that carry liquid and gas is the primary domain of plumbers, pipefitters, and steamfitters. Plumbers tend to focus on water, drainage, and gas pipes in residences and businesses, while fitters typically focus on pipes carrying chemicals, acids, and gases for industrial and commercial uses. The BLS predicts 49,100 new plumbing inspector jobs by 2024, a growth rate of 12%. The installation and maintenance of electrical and communications systems is the main responsibility of electricians. They are trained to use specialized tools for testing and diagnosing these systems. The BLS predicts 85,900 new electrician jobs by 2024, a growth rate of 14%. Ironworkers assemble the steel and iron that supports major structures. They are trained in specialized equipment to align, cut, bolt, and weld metal according to blueprints and other build documents. Also known as erectors, these specialists must be skilled at communicating with crane operators to ensure that materials move safely across a jobsite. The BLS predicts 7,100 new ironworker jobs by 2024 , a growth rate of 9%. There are some habits that ring true across the industry to keep in mind. Construction workers usually start their days earlier than most office jobs. This is done to beat the daytime heat as well as work around busy street traffic. Depending on specific trades, duties can range from reading site plans or managing workers, to getting your hands dirty on actual construction. No two days are exactly the same, so be flexible. The road to a successful career in construction isn't as clear as it should be. Below are some steps to help navigate the construction industry. Also refer to our article about getting jobs in construction  for more information. There are a variety of construction careers, each with its own specific skills and education . As mentioned in the previous section, construction careers can range from administrative to laborer, and it’s up to you to figure out which is the best fit. A unique aspect of working in a trade is labor unions. Unions serve as intermediaries during labor disputes, and ensure that you as the employee is treated fairly. They play an important role  in the way employers and workers function in the workplace. Making it in construction isn’t a walk in the park. It is an extremely lucrative industry that has been dominated by men, and navigating that as a woman can be difficult. Because of this, many women have experienced discrimination and harassment, sometimes deterring them from pursuing a career in construction. Women have to be prepared to potentially face sexism and demeaning comments while breaking new ground in this industry. Education is helping to fix this problem, but there's still a need to be realistic about the current state of the industry. And, while skill and competence are most important, women will also need to go the extra mile to prove themselves. Regardless of challenges, women positively impact the workplace. Women bring valuable intuition and perspectives  to the table, and enhance workplace culture. The construction industry has nothing to lose and everything to gain by having more female employees. Connections matter. Networking is paramount to getting on the right path and advancing careers. Having the right resources, mentors and allies in the the construction industry will make your career goals attainable. Know what resources you have at your disposal. Involvement in organizations such as the National Association of Women in Construction  and Professional Women in Construction , for example, provide educational resources and networking events. Find people to help point you in the right direction. Mentors and allies are valuable resources. 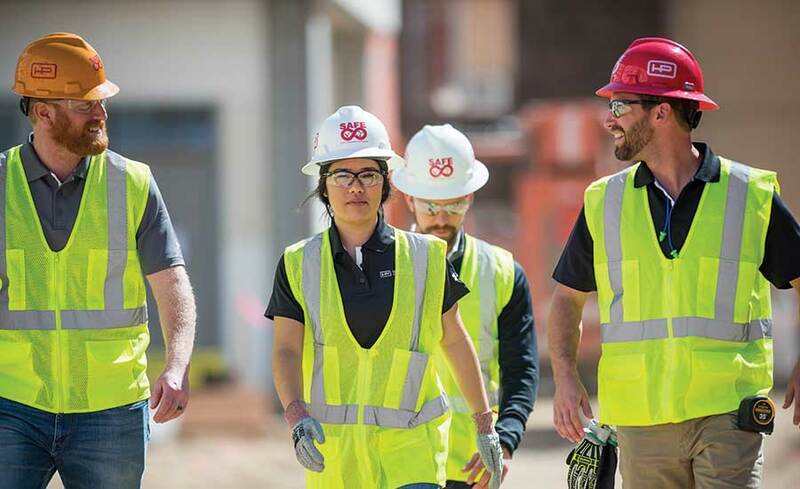 They offer professional connections, as well as all-around support to fellow women in construction . Embrace the fact that you are a badass lady who can do anything you set your mind to. Colleen leads McCarthy's Southern Region Partnership for Women. She is a graduate of the University of Texas at El Paso with a degree in Civil Engineering. It's an exciting time to be a woman in construction. One of the greatest challenges facing our industry is a workforce shortage. Hiring and developing women in all positions, from craft labor to supervision, in the field and in the office, is one way we are attacking the problem. At McCarthy, our Partnership for Women  focuses on personal and professional development, networking, outreach and recruiting to support a growing female population. The industry is slowly evolving to look more like the communities we work in, and women are a big part of that change. Women make up 47.2 percent of the workforce across all industries. In engineering and construction, that number drops to 2.6 percent, according to the National Women's Law Center. Some stubborn social norms and the reputation that we work long hours and get moved around frequently contribute to why we see fewer women pursuing careers in construction. I have learned you can have both, whatever that looks like to you, when you work for a company that truly values a smart and healthy culture. If I could offer some advice, it would be to learn to advocate for yourself, and build relationship with people who will advocate for you. Even if your role is not actually building things, get to know the people who do the actual building. They can teach you a lot that will help you understand your work and the industry better. Judaline is a plumber in New York City and Founder of Tools & Tiaras, a non-profit organization that holds workshops giving women experiential education about construction industry trades. I enjoy working in construction because I love solving puzzles. I’ve been a plumber in New York City for 23+ years and want to expose more women to this amazing field. My goal is to build a system where we don’t have that revolving door of women coming in, learning the craft and then dropping out because of a lack of support. Everyone who teaches Tools & Tiaras workshops volunteers their time, doing it because of their love and passion for their trades. Every month we have a workshop for girls and women taught by tradeswomen who come from carpentry, electrical, mechanic, architecture or whatever we can get to teach these girls. We get requests from people around the world wanting to start Tools & Tiaras chapters. So the need for what we are doing is there. Even if they don’t become a woman in construction, what a woman or girl gets from working with tools can never be taken away from them. We expose, inspire and mentor girls in construction industry careers. What I tell women is that it’s going to be difficult. I tell them that I’ve wanted to quit many times, but I’ve found ways of motivating myself. First, don’t let anyone mess with your money. You’re not going to make this kind of money elsewhere without a college degree. Second, think of it as a career, not a job. Don’t compete with the strength of men. Go back to school, learn blueprint reading, learn welding so that you have a longevity in the business. Third, find a group of women that think like you and support you. Because women in construction tend to be isolated, you’re usually the only woman on a jobsite. So if you can find a network of women, you can have that support. If you can stick in there and have that grit, moxie and determination that no one is going to push you out of this kind of livelihood, then you’re already halfway there. Since 1955 NAWIC has been a support network with opportunities for professional development, education, networking and more. WCOE is a non-profit organization established in 1984 that exists to create opportunities for, influence legislation about and support women-owned construction companies. PWC is a national nonprofit organization founded in 1980 that seeks to support, advance, and connect women and promote diversity within the architecture, engineering, construction, (AEC) and related industries. The Washington Women in Trades (WWIT) Association was founded in 1978 by and for women working in the trades to gather and share information.